A ships AIS (Automatic Identification System) is a digital communications system that allows ships, shore and other stations to exchange position and other information automatically. There are two categories of AIS: Class A and Class B. SOLAS vessels are obliged to carry a Class A device. This device is designed to enhance navigational safety and to provide security information to appropriate authorities. 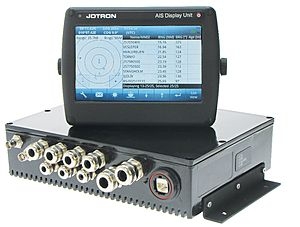 It allows vessel identification, assists in target tracking and simplifies information exchange. It is sometimes found aboard non-SOLAS craft and aids to navigation, and can be used by vessel traffic and other shore stations and aircraft. The AIS is basically a VHF radio communication system operating on marine-band frequencies. Its range is identical to that of VHF radios. Cass A models operate at 12.5 watts, offering an average range of 30 nautical miles. A vessel's dynamic data, position, speed over ground and course over ground, is taken from the GPS. The Class A version uses SOTDMA transmission mode, giving it priority over Class B devices. SOLAS vessels are obliged carry a Class A unit. The vessel's VHF antenna sometimes can be used for both radio and AIS communications.